Art Deco floor registers offer a unique look and are crafted of solid bronze. These floor air vents feature a dark bronze look with a durable powder coat finish. Art Deco floor registers are available in two sizes 3 x 10 and 4 x 10, see exact dimension in table below listed in inches. Your new floor air vents have an all steel damper that can be adjusted to suit your level of comfort. Art Deco floor registers are a great way to add character to a new home or bring character back to your old home. Bronze floor air vents are simple one step drop in installation. 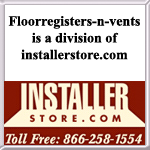 Tip: Special order floor air vents are to be ordered according to the interior hole dimensions and not the faceplate size of an existing register. All sizes are in inches. Important: These are special order floor air vents and typically take 7-10 business days to ship. Dark bronze Art Deco floor registers may have some finish variation from computer monitor and actual register finish due to monitor settings. These solid bronze floor air vents are available to purchase in two other finishes copper bronze and pewter bronze. Art Deco floor registers are an affordable way to add some unique touches to your space and they're made of solid bronze. Order your vents today!